Enjoy a lovely, healthy vegan take on this classic dish. It is quick to assemble but you do need to do some prep beforehand - read through the recipe and ingredients the night before and go for it! Drain the water from the tofu and wrap the block in several sheets of kitchen roll. Leave for 20 minutes to absorb as much water as possible. Use a tofu press if you prefer. Blend the olive oil, parsley and garlic together using a blender or stick blender then set aside. Slice the tofu in half lengthways and then in half again so you have 4 large, chunky slices. Pour the garlic and parsley sauce, then the tamari, evenly over each slice on both sides then set aside. Combine the coating ingredients: nutrtional yeast, cornflour, garlic powder, salt and pepper into a medium sized bowl and mix thoroughly. Cover each tofu slice in the coating mixture and press down to ensure that it has stuck properly. Heat some oil in a large frying pan on medium heat and fry on both sides until golden and crispy. Cook the onion in a little oil, on a low heat, until softened but not brown. Add the wine and vinegar and increase the heat to high and cook until the liquid has reduced by half. Blend this mixture in a high speed blender or with a stick blender and set aside. Combine the cornflour, turmeric nutritional yeast and black salt in a saucepan then whisk in the soya milk gradually to avoid lumps (off the heat). Add the onion mix to the saucepan and sprinkle in the stock cube or powder. Bring to the boil gradually and whisk in the lemon juice. The sauce will begin to thicken quickly so make sure you continue to whisk or it will stick to the pan and form lumps. Slice 2 English muffins in half, toast and spread with vegan margarine. Heat the vegan bacon for 1 minute on each side and place on one half of the muffin. Place one of the tofu steaks on top of the vegan bacon. Take a small handful of kale and place on top of the tomato. 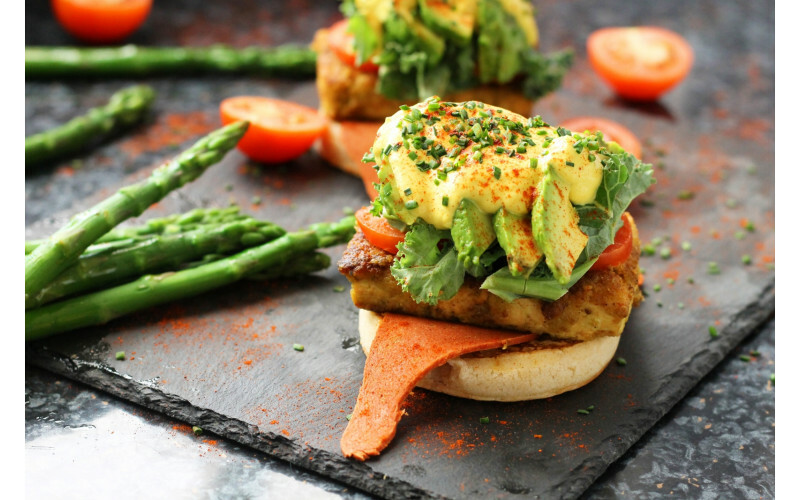 Add some sliced avocado and drizzle with the hollandaise sauce. Top off with finely chopped chives and a sprinkle of paprika. Serve with steamed asparagus and enjoy!